At 77 years old, Argentine piano legend Martha Argerich continues to perform and record. 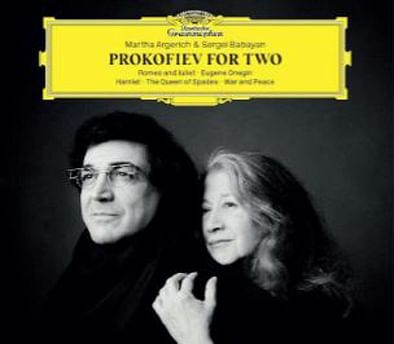 A recent release is an hour of music by Russian composer Sergei Prokofiev (1891-1953), transcribed for two pianos by Armenian-American pianist Sergei Babayan, the latest in a long illustrious line of piano duo partners. Twelve movements from the ballet Romeo And Juliet are performed as a suite and there are several movements in common with Prokofiev's own original set of solo pieces (Op.75) for two hands. New are the evocative Dance With Mandolins and the scintillating music-box effects in Morning Serenade. The Gavotte is a familiar dance rehashed from the third movement of his Classical Symphony, while Death Of Tybalt provides a suitably dramatic and violent end. Much of the music exploits the lower registers of two pianos. The results are brooding and darkly sonorous but richly detailed. Much less familiar are arrangements of Prokofiev's incidental music from Eugene Onegin and Hamlet, film music from The Queen Of Spades, a waltz from the opera War And Peace, and one of his two Pushkin Waltzes. The performances sound freshly minted and spontaneous, and are brilliantly recorded.